Sign our petition calling on Jase Bolger to resign as Speaker of the Michigan House of Representatives. New Details Emerge Over Police Fatal Shooting of Elderly Ex-Marine Kenneth Chamberlain, Sr.
/PRNewswire-USNewswire/ — Over 2,000 citizens both young and seasoned, and members of community activist groups joined forces in protest of a bill that passed through the Michigan Senate earlier this month that will give city Financial Managers broad powers; striping voters of their right to elect such officials. Detroit Mayor Dave Bing and State Governor Rick Snyder were both proponents of the legislation. The well organized march took place at the Coleman A. Young Building in Downtown Detroit this Monday afternoon. The crowd chanted slogans like “They say cutback, we say fight back,” and “Bankers got bailed out, workers got sold out,” and carried signs and banners to Hart Plaza’s Labor Legacy Monument. The new bill passed through the Republican-led Senate to a 26-12 party line vote. Supporters of the bill say that it would lead to earlier intervention by the state, perhaps avoiding the need to appoint an Financial Manager at all. Opponents of the legislation are concerned because it will give the managers, appointed by Governor Rick Snyder, the power to terminate union contracts and strip local elected officials of most power. The day of the protest in front of the Spirit of Detroit marks the 43rd anniversary of the assassination of Dr. Martin Luther King, Jr., who died in Memphis in 1968 while defending the collective bargaining rights of sanitation workers in the city. On March 29th, 1968, King went to Memphis in support of the black sanitary public works employees, represented by a local union, who had been on strike for two weeks for higher wages and better treatment. On April 3rd, King delivered his “I’ve Been to the Mountaintop” address, historically 2nd only to his iconic “I Have a Dream” speech. In the early evening hours of April 4th, King was shot at the Lorraine Motel as he was leaving his room, accompanied by the Reverend Ralph Abernathy and Jesse Jackson. 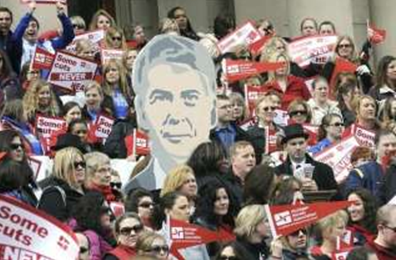 Like the late Dr. King, the marchers are fighting for collective bargaining rights. Wielding protest signs, citizens chanted for Detroit city representatives Saunteel Jenkins and Brenda Jones to take action to remove current City Pension’s General Counsel, Ronald Zajac, currently under a federal investigation regarding his misappropriation of the city’s pension fund. Garrick Simpson, 57, of Detroit, a member of AFSCME Local 542, has been employed with Detroit Parks and Recreation for 28 years. The Detroit Free Press reported a few months earlier that Mayor, Dave Bing, was among the first to suggest that the management of Detroit worker’s pension be redirected to the state. Bing’s favor of the legislation, amid rumors that Michigan Governor Snyder could nullify the City Council and subsequently name the former steel mogul, the Pension’s Financial Manager was met with public outcry and riots leading up to the march. Among the groups represented at the march were the Community Coalition; the Shrine of the Black Madonna’s political arm; Black Slate; the Marcus Garvey Group; Citizens Against Violence; Black Panthers; and numerous union members. A flurry of red-and-white signs with the words “Some cuts never heal” flapped furiously in front of the Capitol on Wednesday afternoon. The signs were accompanied by more than 200 nurses, nursing students and local and state officials who criticized Gov. Rick Snyder’s budget proposals and legislation that gives emergency financial managers the authority to cancel union contracts. Emergency financial managers can be appointed by the governor for school districts or other municipal governments…. …The effort was part of the Michigan Nurses Association’s annual political action day. “If (Snyder) breaks the nurses unions, that’s endangering patients,” said Cindy Inman of Lansing, a nurse currently in search of work. Inman and others at the rally said unions help keep patient-to-nurse ratio and shift sizes manageable. Otherwise, overworked nurses can be harmful to patients, they said. “Nurses first and foremost are patient advocates,” said Felicia Kieme, an operating room nurse at the University of Michigan Hospital and a Michigan Nurses Association board member. View full sizeGreg DeRuiter | APAbout 200 other college students from around the state at the Capitol last week. KOCHVILLE TWP. — Saginaw Valley State University students joined a list of groups protesting potential cuts in state funding, a campus newspaper reports. 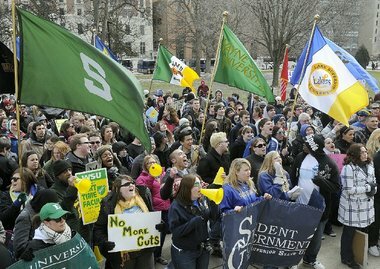 About 91 SVSU students traveled to the Capitol lawn in Lansing on Friday to oppose higher education cuts Gov. Rick Snyder has proposed, The Valley Vanguard’s Toni Boger reported in Monday’s edition. The creative re-wording of the acronym — the brainchild of the United States Student Association — generated additional interest, The Vanguard reports. The Valley Vanguard: Julie Boon, Student Association (SA) president and political science and history junior, said that an aggressive marketing campaign generated student interest. “We wanted students to know how much this was really going to affect them, and how much they’re going to have to make up for the lack of funding for next year,” she said. The campaign included mass e-mails to students, window paintings, posters, signs hanging from ceilings and visits to individual classes. A number of public university students — from institutions such as Michigan State University, Lake Superior State University and Wayne State University — joined the protests last week. The Vanguard publishes weekly during the fall and winter semesters. The McGlynn: Any comments from those you voted for this fool? Further, please note the funding by the Walton Foundation (ie Walmart). “Gov. Snyder’s decision to sign this reckless measure cutting the lifeline for Michigan’s unemployed will reverberate for years,” said Rep. Sander Levin (D) of Michigan in a statement. “Republicans … gave Michigan the dubious distinction of becoming the only state in the union with 20 weeks of state unemployment insurance,” he said, adding that the bill will “affect hundreds and hundreds of thousands” of future unemployed workers.